The first time U.S. Marines went on patrol from this base in southern Afghanistan, the Taliban were ready. The militants shot and killed a 21-year-old lance corporal just 150 feet from the perimeter. The Marines patrolling through the green fields and tall mud compounds of Helmand province’s Sangin district say they are literally in a race for their lives. They are trying to adjust their tactics to outwit Taliban fighters, who have killed more coalition troops here than in any other Afghan district this year. “We kind of snuck our nose in the south to see what the south was about and we found out real quick that you don’t go south unless you have a lot of dudes,” said Sgt. Adam Keliipaakaua, who was leading the patrol. The Marines now have a better idea of where they will be ambushed around their base and have doubled the size of their patrols to increase the amount of firepower they can direct toward the Taliban. On Thursday, the Marines killed 15 militants in an hourlong firefight, according to NATO. Those who patrol through the main bazaar in the district center now know to look to the skies. They said the Taliban often fly white kites over the local mosque to signal the presence of the Marines. To avoid walking into a firefight, the Marines look to see whether kids are around. Their absence could mean an impending attack, but the Taliban also use children as spotters, so the tactic isn’t foolproof. “A little kid will run around the corner and run back, and a minute later you are being shot at,” said Keliipaakaua. But the threat of an ambush pales in comparison to the biggest danger lurking in Sangin and much of Afghanistan: the scores of IEDs buried in roads, trails, compounds and even canals. Many are largely constructed out of wood or plastic, making them very difficult to detect. Three days after Ceniceros was killed, another member of 3rd Platoon, Cpl. David Noblit, stepped on an IED in a compound located in dense vegetation across the street from Patrol Base Fulod. Noblit survived the explosion but lost both his legs (for a discussion of Ceniceros, see portions of the article edited for length). The battalion has been hit with about 40 IED attacks and has found more than 100 other bombs before they exploded. But the Taliban are always watching and adapting as well. One of the last Marines from the battalion who was killed stepped on an IED buried underwater in a canal. First, spotters and signalers are a common problem with the Taliban, as they were in Ramadi, Iraq. They have not been dealt with as harshly as I have recommended. A spotter or signaler is no different than a combatant, and they were treated as combatants by Marines in Iraq whether they held a weapon or not. Then again, dealing with the spotters as I have recommended (and the Marines actually did in Iraq) would require a change to the rules of engagement. Our generals are smarter than those successful Marines in the Anbar Province, and so we don’t do things like that anymore. Second, having a “lot of dudes” is the equivalent of my recommendations in previous coverage of Marine combat action in Sangin. There are many locations in Afghanistan that need attention and additional troops, from the Paktika province to Kunar and Nuristan, and indeed, the whole Pech River Valley area. The border needs more mentored ANP, and even the North is coming under increasing Taliban attention. I have made no secret of my full court press for more troops. But in this case, the U.S. Marines have the Helmand Province, and it makes no sense to have Marines on MEUs pretending that they are going to conduct a major, full scale, water-borne amphibious assault against some unknown (or non-existent) near-peer enemy while their brothers lose their legs in Afghanistan. In fact, I would suggest that it is immoral to send Marines into harm’s way without the requisite support and manpower. The support and manpower exists. It’s currently located at Camps Lejeune and Pendleton preparing to board amphibious assault docks and waste millions of dollars floating around the seas and stopping at every port so that Marines can get drunk. We can do better than that for the Marines under fire in Afghanistan. Finally, it makes sense to fight the Taliban where they are. If we don’t they will simply relocate to the areas we are trying to secure (such as Kandahar) and fights us there. It is conducive to minimum noncombatant casualties to conduct combat operations in Sangin rather than in Kandahar if possible. MARJAH, Afghanistan — In the first two months of a seven-month tour, US Marine Corporal Chuck Martin has been in 16 firefights. The 24-year-old native of Middletown, R.I., has done laundry twice, mailed five letters, and received two. He has spent 378 hours on post and 256 hours on patrol. He has crossed 140 miles of thorny bomb-laced farmland and waist-high trenches of water on foot. Along the way, he has ripped eight pairs of pants, ruined two pairs of boots, and downed 1,350 half-liter bottles of water. 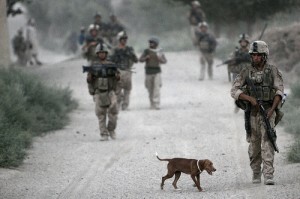 His platoon has killed at least eight militants in battle and nine farm animals in crossfire. The rugged outposts he has lived in have been shot at 46 times. Martin’s list, stored on spreadsheet on his laptop, offers a snapshot of American military life in this rural battle zone, where a new generation of young service members are growing up thousands of miles from home. At one outpost called Inchon, a droning generator provides power for iPods and laptops loaded with movies, and just two lights — one for the Americans, the other for their Afghan counterparts. Service members have knitted together several shaky chairs from the metal fencing of discarded Hesco barriers. At many bases, Marines sleep outside on cots inside hot-dog shaped mosquito nets. There are no toilets and no showers. Troops bathe with water warmed by the afternoon sun. Fleas are such a problem, many Marines have taken to wearing flea collars made for cats or dogs around their wrists and belts. Todd paints an effective picture of the hardships endured by the Marines in the Helmand Province of Afghanistan. The Soldiers in Korengal lived an equally hard existence, as do some of the Soldiers elsewhere in Afghanistan. But in a tip of the hat to large population centers, far too many Soldiers live in huge FOBs rather than connected with the population. In order to find and kill the insurgents, Soldiers and Marines must be spending the majority of their time with the people amongst whom they hide. There is no downtime for the Marines. Neither can there be any for other participants in Operation Enduring Freedom, whether infantry, logistics, or vehicle and aircraft maintenance. Downtime comes after the deployment.